While many VPN services The Best VPN Services The Best VPN Services We've compiled a list of what we consider to be the best Virtual Private Network (VPN) service providers, grouped by premium, free, and torrent-friendly. 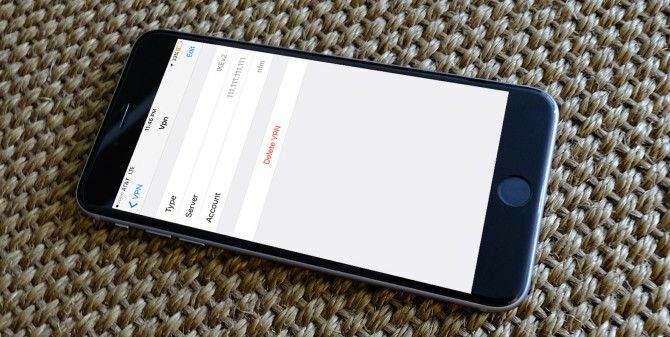 Read More make it really easy to set up a profile on your iPhone, with apps like TunnelBear actually doing all the heavy lifting for you, the method to delete those profiles is buried in your phone. Here’s how to find that setting. There are two ways to delete VPN settings, and each method is remarkably easy to do. With apps like TunnelBear that do the set up for you, all you have to do is delete the app from your phone. This will remove the profile altogether. If you’ve manually entered the VPN settings, go to Settings > General > VPN. There you will find a list of the VPN profiles you have set up. Tap on the “i” button next to the one you want to remove, and you’ll find a delete button beneath the details. You will be prompted to confirm you want to delete the profile, and it will be removed from your phone. Do you use VPNs on your phone? Let us know in the comments. Explore more about: Smartphone Security, VPN. Wonder why almost all VPNs only cover the common apps but not the system ones like Tor. Even legal system apps can spy on you.. I have absolutely no idea what VPN is. It's off on my phone.